It’s Time to Clean Things Up & Get Things Moving! Spring is coming… No, it’s still snowing! Spring is coming… Wait, wait, spring is here! It’s in our nature to know that this is a great time to get up, get moving, and clean things up. 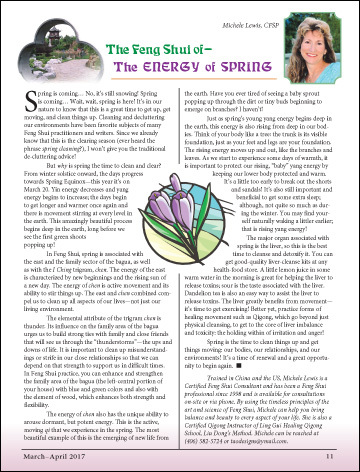 Cleaning and decluttering our environments have been favorite subjects of many Feng Shui practitioners and writers. Since we already know that this is the clearing season (ever heard the phrase spring cleaning? ), I won’t give you the traditional de-cluttering advice! But why is spring the time to clean and clear? From winter solstice onward, the days progress towards Spring Equinox—this year it’s on March 20. Yin energy decreases and yang energy begins to increase; the days begin to get longer and warmer once again and there is movement stirring at every level in the earth.